This is a day for winners. 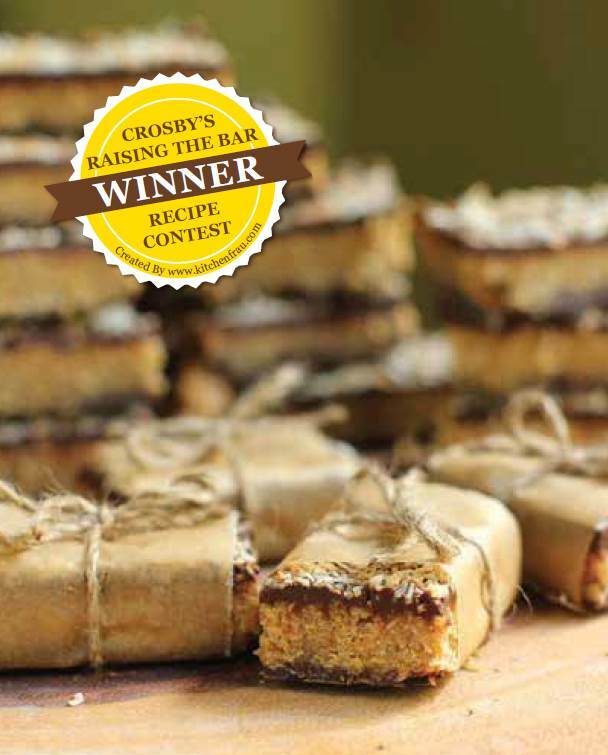 With yesterday’s election, and today’s media and water cooler buzz, I thought it was a fitting time to announce three additional Canadian champs – the bar recipes that came out on top in our recipe contest with members of Food Bloggers of Canada. 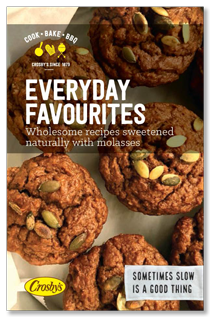 You can click through to each blogger’s website for the recipe. For those who love to indulge in chocolate and creamy caramel. 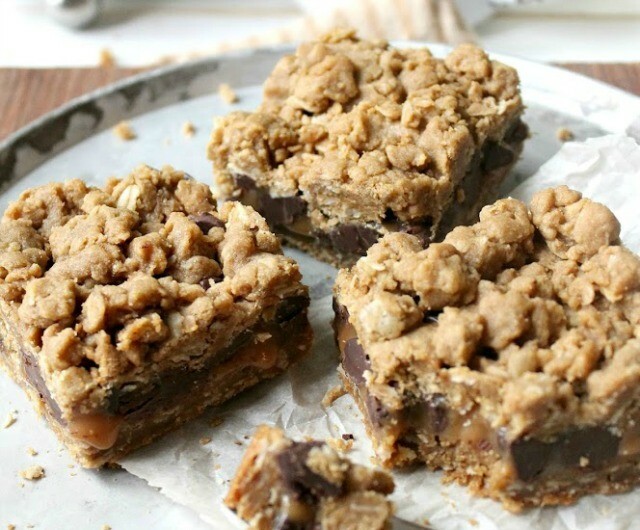 These bars are rich, over the top and irresistible. 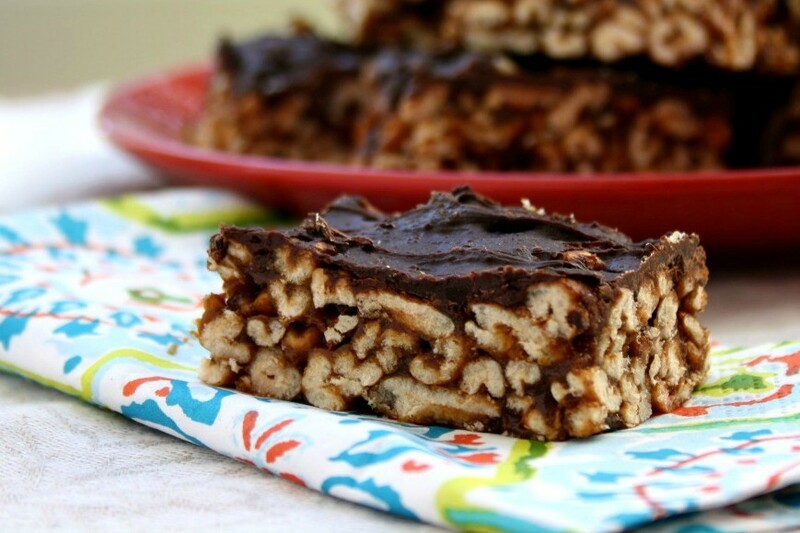 The texture is delightful – a little crumbly on top, soft caramel in the middle and lots of chocolate in every bite. A deceptively simple bar that’s full of surprises. 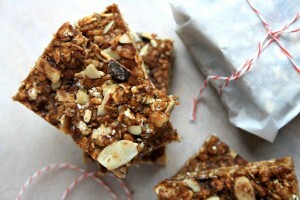 If you like a classic granola bar with a little oomph then this is the bar for you. Generous on the candied ginger this bar has a clean wholesome feel and the sort of texture that keeps you nibbling away until half the pan is gone. 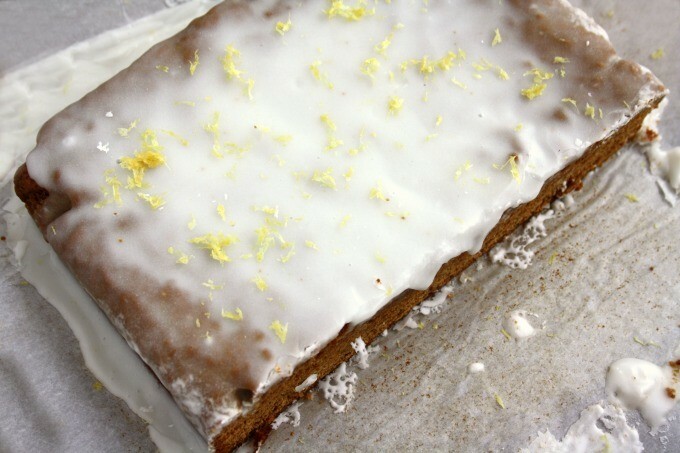 Lemon and gingerbread…This isn’t some new-fangled flavour pairing, it’s an East Coast classic. 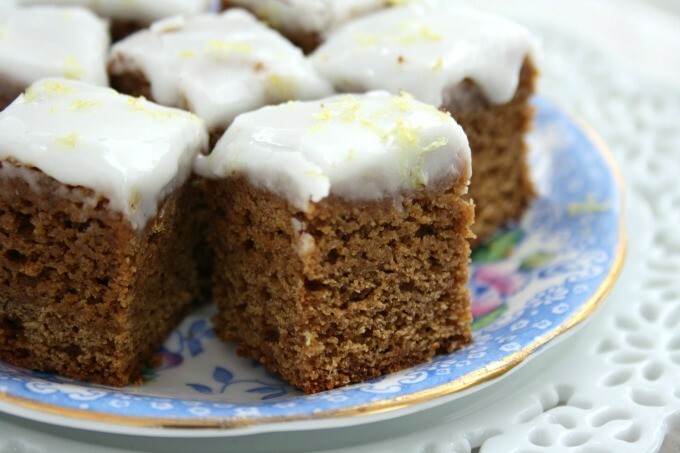 Lemon with gingerbread reminds me of my grandmother. She used to serve her gingerbread cake with a hot lemon sauce, which was how everyone around here ate it. And sometimes she’d glaze her soft molasses cookies with a lemon icing. If it wasn’t for the fact that I grew up with the combination of lemon and molasses I might not get why they pair so beautifully. I like to cut these squares very small so you can pop a whole square in your mouth at once. That way you’re tasting the lemon icing and the spices all at once, which is just how it should be. 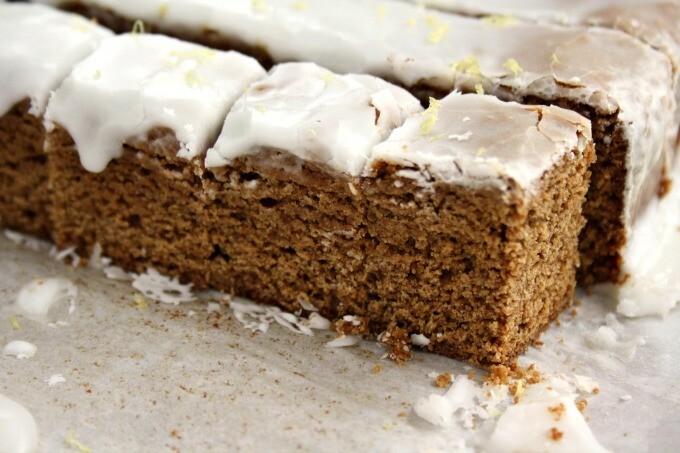 These gingerbread squares have an especially delicious spice blend (5 spices in all) and they’re not too rich so can handle the sugary glaze. 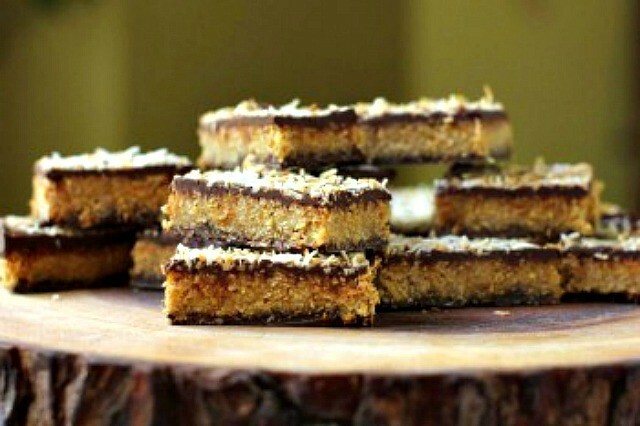 Think brownies when you’re baking these squares. The shorter the baking time the more fudgy the squares will be. Preheat the oven to 350 F. Line an 8×8-inch pan with parchment or grease it well. In a large bowl whisk the flour, baking powder, baking soda, salt, brown sugar, and spices. In another bowl, combine the eggs, molasses, and melted butter until well combined. Add to the dry ingredients and stir until everything is incorporated. Batter will be thick. Scrape the batter into the prepared pan, using the back of a wooden spoon to press it out to the edges. While the bars are cooling, whisk together the glaze ingredients, making sure there are no lumps and adding a bit more icing sugar if it feels too thin. Pour over bars and spread to the edges. Or lift the bars by the parchment and tilt every which way to spread the glaze. Let glaze harden before cutting. I recently discovered a lemon glaze recipe on the blog Kitchen Magpie that will forever replace my current method for lemon glaze. 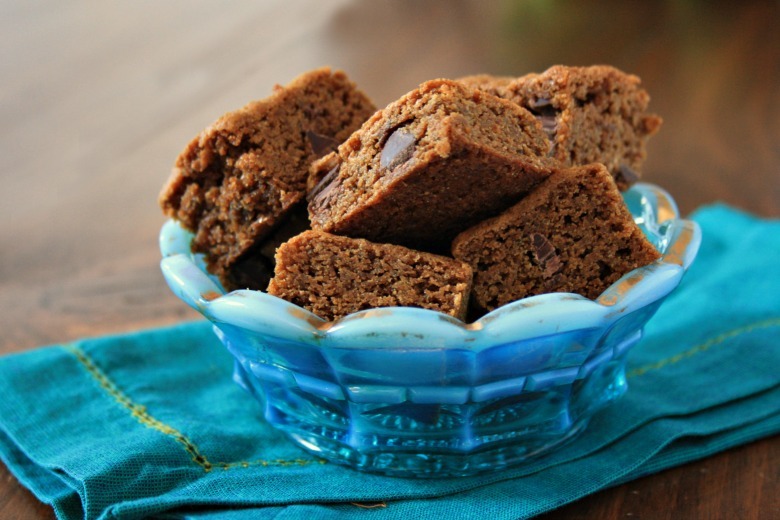 These Brown Butter Molasses Blondies are chewy like a good cookie, have an extra nutty flavour from the browned butter and are studded with chocolate chips. January can be tough – All those adjusting-after-the-holidays aches and pains.  Great food and late nights give way to early mornings, rushed dinners and routine. Why on earth people throw New Year’s Resolutions into the mix I’ll never know. While we all endure the deep freeze and now brace for a weekend of rain I’m tossing a little indulgence into the mix, to lighten the load that is January. 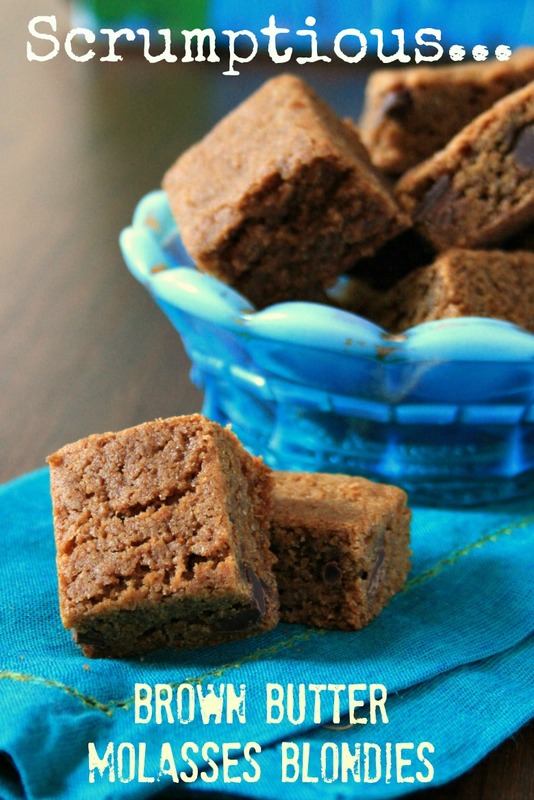 These Brown Butter Molasses Blondies are chewy like a good cookie, have an extra nutty flavour from the browned butter and are studded with a few chocolate chips. (Flavor wise it’s worth the effort to brown the butter). Preheat the oven to 350 F and line a 9”x 13” pan with parchment paper. Let the butter cool for a few minutes then stir in the brown sugar. Combine well then add the molasses. Pour into a large bowl and add add the eggs, one at a time, beating well after each addition. Stir in the vanilla. In another bowl combine the flours, baking soda, ginger and salt. Add to the butter-sugar mixture. Toss in the chocolate chips and mix until everything is incorporated. Bake for 30-35 minutes. Don’t over bake! Cool in the pan for about 10 minutes then lift them out of the pan, parchment and all, onto the cooling rack. *You can just melt the butter and move onto the next step if you don’t have the time to let it brown. 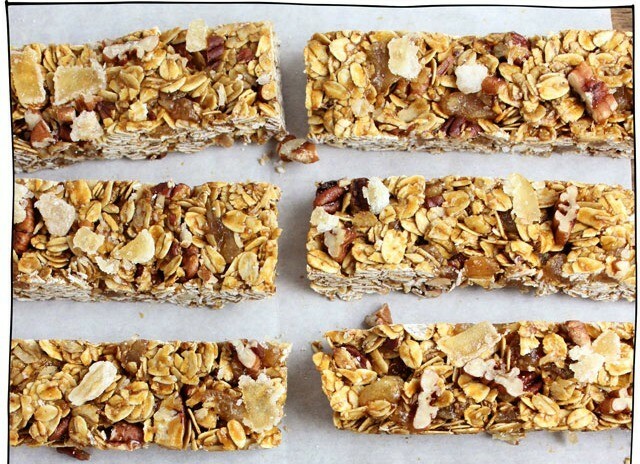 Remember cereal bars from the 1970s? My mom made them all the time. She was forever on the lookout for big batch sweets because there were seven of us kids rushing in the door after school each day, famished and ready to devour anything on the counter. Mom used to buy these huge bags of puffed wheat cereal that were about half the size of our dishwasher. I swear they took up a full seat in the car coming home from the grocery store. 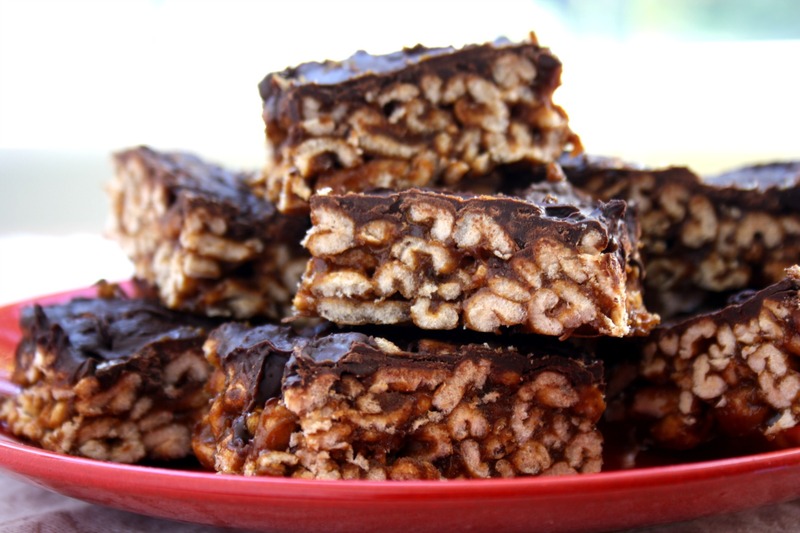 I wasn’t much for eating puffed wheat or puffed rice with milk (too much floating and the sugar wouldn’t stick) but I loved the big batch cereal bars. A little chewy, they always seemed to last longer than a cookie and mom cut them into nice big squares. 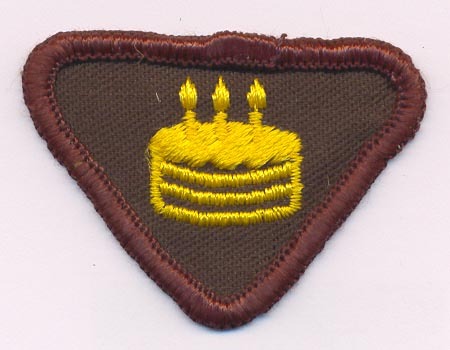 It was likely cereal squares that I made to get my “Baker” badge in Brownies. They’re that easy. Just melt a few ingredients together in a big pot, stir in the cereal and press them into a pan. The hardest part is waiting for them to cool. The only hitch with mom’s recipe is that they used to stick together in the tin. A thin coating of dark chocolate on the top mostly takes care if that and it dresses them up a bit. Like an 8” x 8” pan with parchment paper or grease it well. In a large pot over medium heat combine the almond butter, molasses and honey or maple syrup. Stir until it comes to a gentle boil. Let it bubble for 30 seconds to a minute then add the vanilla, salt and pour in the cereal. Stir well with a wooden spoon or rubber spatula. Scrape the mixture into the prepared plan. Press lightly to spread and flatten. 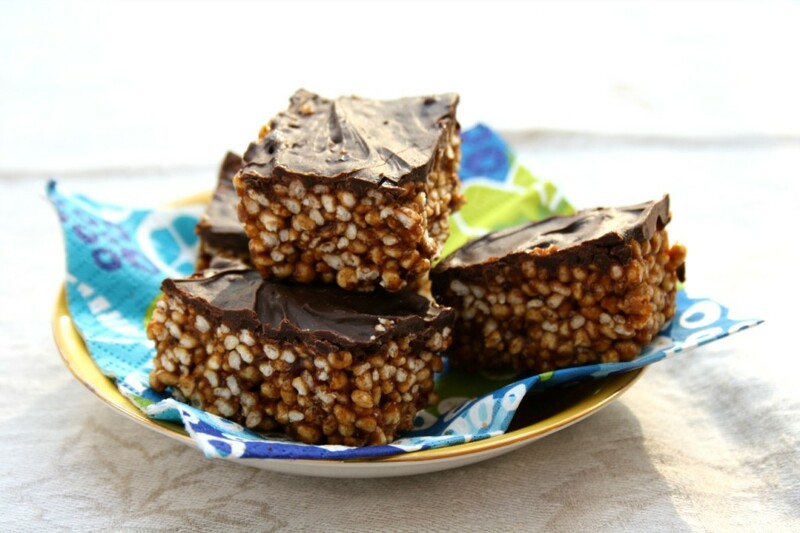 While they’re cooling on the counter, melt the chocolate in a heavy pot, in the microwave or in a double boiler. Spread melted chocolate over top of the squares and refrigerate until the chocolate is set. Best eaten within two days.